Students have fun AND stay focused while they are reviewing for their state’s standardized tests, district tests, and classroom tests. The 15 tournaments and 8 centers come with step-by-step directions, game boards, and game pieces in 119 pages. The tournaments may be used for any grade and any subject, but you need to supply the questions you want your students to study. You may use your state’s released questions of past standardized tests, test prep booklets, previous district tests, or questions from your classroom textbooks. Go to TeachersPayTeachers.com and purchase task cards on a specific subject or standard you want to reinforce. These tournaments work! In California, students are deemed Advanced, Proficient, Basic, Below Basic, or Far Below Basic on the state’s standardized tests. Last year, when comparing my students’ 2009 California Standards Test scores with me and how they had done the year before, one student went up three levels from Far Below Basic in second grade to Below Basic to Basic to Proficient with me in third grade. Three of my students went up two levels. Nine of my students went up one level. Three students stayed in their same level from second to third grade (one student was Proficient and stayed Proficient & two students were Advanced and stayed Advanced.) The final student in my class last year did not have a second grade score, but scored Advanced in my class. I receive similar test scores each year. These tournaments are timeless! Even if your state changes the format of the standardized test, you can still use these tournaments to review the standards. Even if you change to a new grade or have to teach a different subject, you can adapt the tournaments to your new class. The possibilities are endless! Change the rules of the game to meet the needs of your specific class. Make a copy of the “Race Car Game” and have two students play against each other with a set of questions in a learning center. Choose the particular tournament according to what you want to focus on. I use the “Math Field Day - Slow Version” Tournament when I want to give my students a longer time to solve math word problems in their teams. I use the “Math Field Day - Fast Version” Tournament when I want my students to work quickly and accurately on math computation problems. Elementary students can review and practice their times tables, sight words, vocabulary definitions, and spelling words. Middle School and High School students can memorize important events in social studies or balance equations in chemistry. I prepare my students for their state standardized tests in a very strategic way. You may want your school to purchase a LIFETIME school site license, so that all of the teachers at your school...and any new teachers...may use these tournaments and centers. 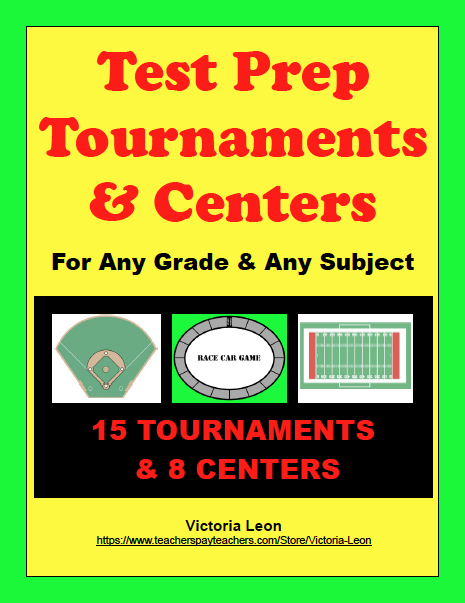 "Test Prep Tournaments & Centers For Any Grade & Any Subject-SCHOOL SITE LICENSE" may be purchased at https://www.teacherspayteachers.com/Product/Test-Prep-Tournaments-Centers-For-Any-Grade-Any-Subject-SCHOOL-SITE-LICENSE-3111729.